Piso Fare 2019 Promos Until 2020: How is Php 799 Promo for you? Cebu Pacific Piso Fare: To all our fans and readers, we regret to inform you that there are no P1 fare promos yet but don't need to worry! Cebu Pacific has come up with promo flights that you can avail both local and international flights. 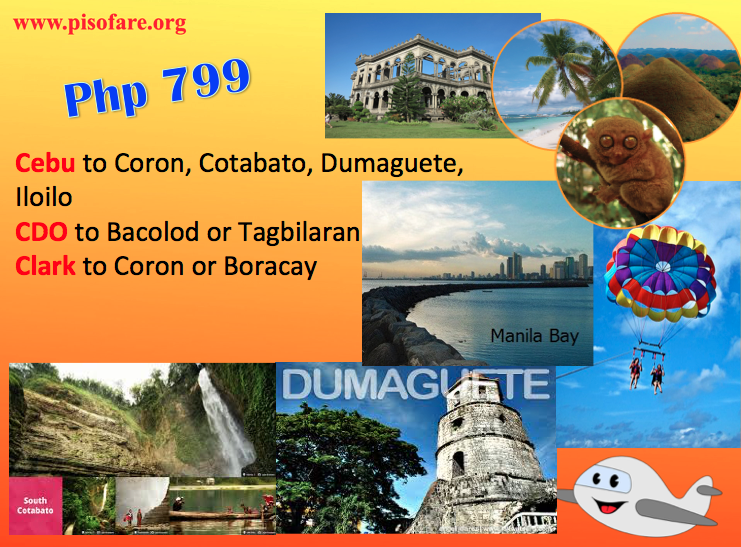 It seems trips to the Visayas region have cheaper promo airfare. There are famous local tourist attractions. If by any chance you have been to these places, it's about time to bring as well some of your friends, or families or new found lover back to these picturesque wonders of the world. Below are promo details. Php 799 is the cheapest plane ticket you can have. Mind the base stations where the promo is effective. But then again, fees and taxes do apply when booking online. Also mind the travel dates where the promo is also set. Happy booking! The international set up is really promising! Do you have an Asian city in mind? The most affordable fare you can book is Php 1799 and that is a flight going to one of these options: Brunei, Kota Kinabalu or Singapore. Next, you may think again to check Jakarta, Indonesia! It's actually very near to the Philippines and it has lots of things to offer like having your shopping spree of affordable items. But if you prefer to visit Bangkok, Busan, Guangzhou, Hanoi, Ho Chi Minh, Kuala Lumpur, Singapore or Xiamen. You can and the base station is in Manila. So expect more Filipinos to really be traveling to these locations. How do you picture yourself shopping at Chatuchak market in Bangkok? Or if you're a movie buff, do check out the famous, Busan in South Korea! How is that? Or keep an eye on Hanoi or Ho Chi Minh. Make sure to learn a little French. Enjoy these promos and is never too late to check available tickets at this time! You still have ample time!